Happy Independence Day, America. We're the land of the free and the brave. Happy Independence Day! To those who have freedom to be and express who you are, do it boldly and passionately & never take it for granted! People have forgotten what 4th of July really is. Its the day we got the freedom we use everyday. Its not fireworks and parties. Thats just what makes it fun. Thankful for all our soldiers and branches of military as we celebrate our Independence Day. Many of them won't be home to do the same. 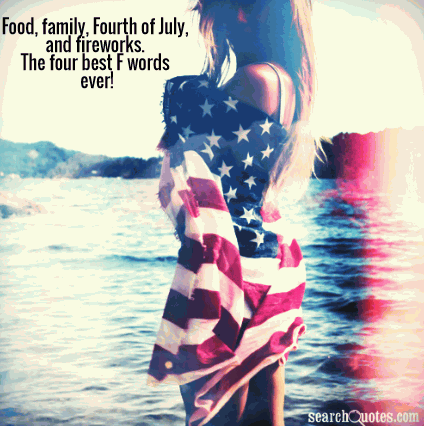 Food, Family, Fourth of July, and Fireworks. The four best F words ever! It's Independence Day. Lets proudly wave our American flags...made in China! Happy Independence Day! And God bless each and every one of our troops...may you ALL find your way home safe and sound! Patriotism is easy to understand in America. It means looking out for yourself by looking out for your country. Happy Independence Day. 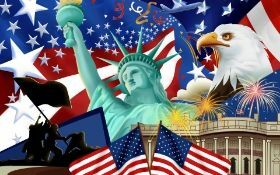 Independence Day is celebrated all across the globe in all the sovereign nations of the world. This day is observed in commemoration of a nation's independence from a foreign establishment. World history has it that the British had annexed many territories all across the globe and established the Queen's rule in them. Revolts and battles for independence followed and when Britain suffered vastly in the Second World War, they had to recede. Many countries in the east attained freedom and celebrated Independence Day. Each year as we celebrate Independence Day we are reminded about the selfless contribution of the martyrs who gave up their lives for their country. Quite rightly so, because no civilian ought to take this freedom for granted, instead we ought to respect and put our nation first. The sole purpose of celebrating Independence Day revolves pretty much around this fact.